Houghton Mifflin Harcourt, 9780618068883, 480pp. 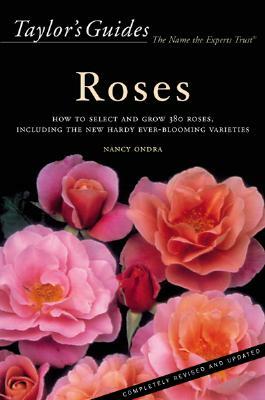 • photographs of almost 400 roses, with a quick reference to fragrance, winter hardiness, and disease resistance • every important class of rose - Species Roses, Old Garden Roses, Shrubs, Hybrid Teas, Floribundas, Grandifloras, Miniatures, and Climbers • suggestions for carefree border and ground-cover roses • an encyclopedia entry for each plant, noting its uses and limitations • a pest and disease chart that describes the damage, its cause, and ecologically safe controls. Whether you want to buy a single carefree bush or maintain a whole garden of perfect roses, this Taylor's Guide has everything you need to know to succeed the first time. Nancy J. Ondra owns a small specialty nursury in Emmaus, Pennsylvania. She is the editor of many Rodale gardening books and the author of three Taylor's Weekend Guides: Soil and Composting, Propagation, and Pests and Diseases. She resides in Pennsburg, Pennsylvania.